I am always on the lookout for ways to make encounters run smoother. The longer combats in 4E feel quite different than the quick skirmishes of the 80s era Red Box I grew up with. Extended fights aren’t necessarily a bad thing, but for me, learning the system along with my players, I want to do everything I can to grease the wheels..
I’m not the only DM who wants to do this. Many other more experienced folks like Sly Flourish and Dave the Game have already dealt with this issue. I’ve learned quite a bit from techniques like planning an “out”, hanging initiative trackers on my DM screen, and using monster data cards. Each time we play, everything works better, and the game becomes more and more fun. As my players level up, though, I find both they and their opponents inflict lots of status effects in battle. Slowed, dazed, ongoing damage… many different status effects come up when spells and abilities start flying on both sides. Keeping track of all this information can be a chore, and I know there are times when I’ve missed a condition here or there that could have altered the outcome of a fight significantly. All sorts of solutions to this problem can be found online, ranging from purchasing magnetic disks and flags to simple things like pop bottle rings and glass beads. There are advantages to each, as well as drawbacks. I wanted something relatively cheap, easy to set up or remove, and visible across the table. Pop bottle rings seemed to be the best solution, but my family and I don’t drink much soda, and I am impatient. I needed something for my next session; most DMs will likely understand the feeling. After doing some digging, reading some comments, and general brainstorming, I found what I think will be the optimum solution. Yes, the same clips you see little girls fixing their pony tails and braids up with. After doing a bit of Ebay searching, and asking my wife for advice (that was an interesting conversation, I can assure you), I found a set of 144 mini hair clips in various colors for less than $10 bucks shipped. Sure, I felt a bit less manly, but the whole experience will make my first trip to the craft store for cake decorating stands that much easier. The clips arrived yesterday, and they are fantastic! They are easy to attach and remove, and they grab onto swords, wings, shields, or appendages no problem. They aren’t heavy enough to make a mini fall over, either. The only concern I have now is what color stands for what condition; I suppose that’s something I’ll come up with on the fly for a few sessions. Naturally, there were more pink clips than any other color, so I might make “light red” represent the bloodied condition. Who says monsters can’t bleed pink in my campaign? My first session with the clips will be later this evening. I am looking forward to seeing how my players react, as well as to what effect the clips have on the speed of combat. If they make it easier on myself and my players, that $10 will have been money well spent. 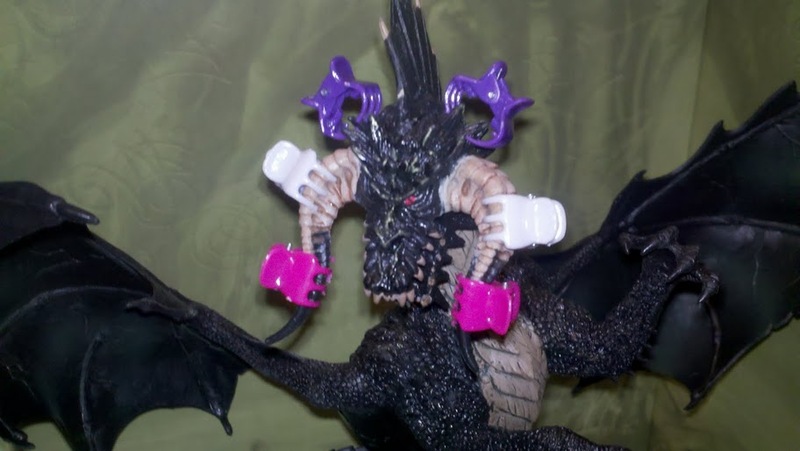 And besides, every gargantuan black dragon needs a few accessories, right? This entry was posted in D&D, DM Advice, Dungeons & Dragons and tagged DM Advice. Bookmark the permalink. Hah, that is a cool idea. 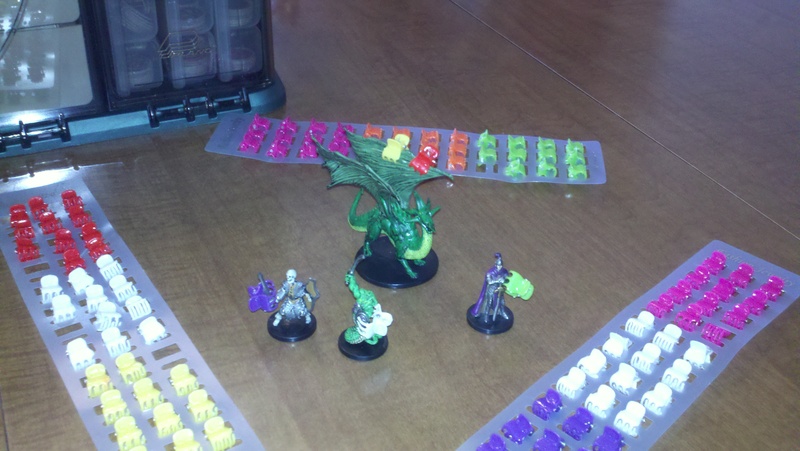 One of our players purchased some color-coded markers to slide under each mini to track conditions. I keep track of monster effects in a program, MasterPlan, while running encounters. Another good tip is to ignore keeping track of effects on your monsters because the PCs will readily inform you each round! Not a bad idea. As a suggestion, pick a colour for Bloodied and make it that everytime. Then for the other colours they can change depending on the encounter. Such as, Green is ongoing acid in this fight and maybe ongoing poison in another, but if there is acid in both, make it green and make poison yellow for that fight. It will make sense eventually. I’ve used paperclips since 4e started. They can be bent into hoops or looped onto swords. I bought a box of 800 with 8 colours for like $8. And I bought a supplemental pack that has striped paperclips in various colours as well. Plus I have “actual red’ for bloodied. Thanks for the replies, folks. Id DM, you are absolutely correct that players are very good about remembering ill effects on monsters, even though they tend to forget those that are debuffing themselves! PinkRose, the paperclips idea is also a good one. I agree that a common color for bloodied is needed, while others can change from fight to fight. The first session with the clips was a smashing success. They were easy to use and made the fights go faster, which is exactly what I wanted. I even used them to differentiate between minis, i.e. “I’ll attack the purple skeleton”, that sort of thing. Might put numbers on the white clips for this purpose in the future. We’ll see.